Grace and I had a wonderful day on Wednesday, we had a play date scheduled at our house. Grace loves other kids, but we don't have any within walking distance to our house. Since we are a one-vehicle family, play dates are rare. Especially, since we are an hour away from our friends in the city. Recently, thanks to FaceBook, I reconnected with a high school friend that has an almost-3-year old daughter. We've gotten together twice for play dates. Yesterday, they drove up from the city and Grace and I loved having the company! On Tuesday, I was trying to decide what to serve for lunch. Lunch for the girls was an easy choice. But I couldn't decide what I wanted to prepare for us moms! I remembered that I had some oven-barbecued chicken breast in the fridge, so I picked it from the bones and diced it up. Then I sat down at the computer to search for a recipe. I knew I didn't want the traditional mayonnaise-based chicken salad, since we just had Crunchy Tuna Salad the week before. I went to allrecipes.com and searched for Barbecue Chicken Salad. There were a few recipe options, but this is the one I chose to prepare. I adapted this recipe bit, by using less celery and by using my homemade barbecue sauce as the base. I also used a white onion istead of a red one. Mmmm! 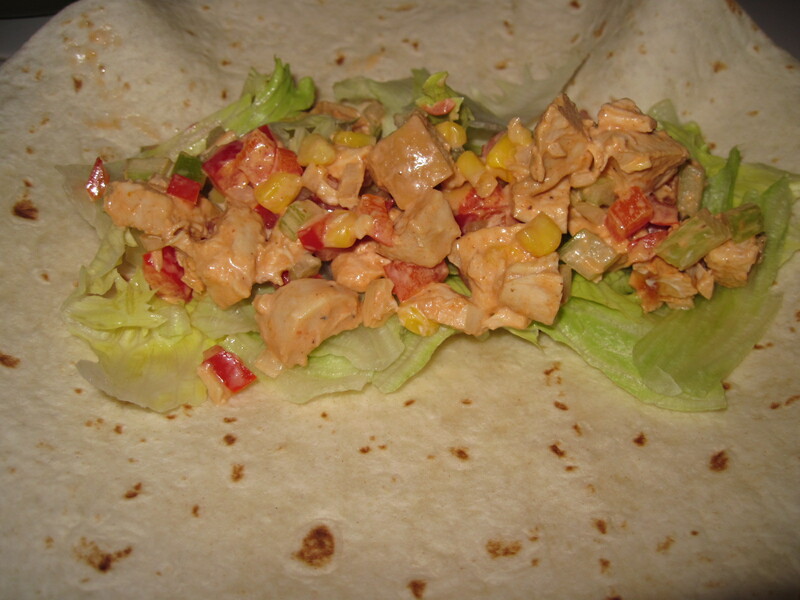 We ate the chicken salad on large flour tortillas with lettuce. Mix all ingredients in a bowl. Cover and refrigerate until serving. I used 2 leftover bone-in split breasts leftover from a previous dinner. I used frozen corn that I thawed in the microwave. I didn't measure the corn, just added it until I thought it looked good! Next time, I will add a dash or two of Tabasco Brand Chipotle Pepper Sauce before wrapping it up. It's already added to the barbecue sauce, but the extra dash or two would spice it up nicely! Joe thought some thinly sliced avocado would be good added to the lettuce and chicken salad before wrapping up in the tortilla. I thought some black beans or diced cucumbers (seeded) or even some shredded cabbage would be tasty added to the salad. This would also be great served on top of a green salad, using some extra sauce and mayo as a dressing. I always worry about making a new recipe for company without trying it first. 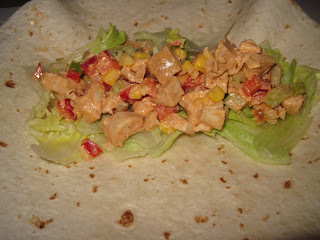 So, after mixing it up on Tuesday, I decided to have some in a wrap for dinner that night. Loved it! Merry and I ate the wraps for lunch and after they left, I was too tired to prepare dinner, so Joe and I ate the leftover chicken salad for dinner later that night! I really loved how easy and tasty this salad turned out! It's a great summer meal since it's a cold salad that can be made a day or two in advance. For me, it's a great way to use up celery in the summer time, since I don't make as many soups or stews during the hot, summer months! I also love that it can be made with leftover chicken, making it not only easy, but frugal as well! That looks really good! Thank you for sharing! I love how you mixed this up (literally) from the traditional chicken salad. This is a fun idea that wouldn't have occurred to me, but it sounds terrific.